Last week I bought a Pantone Color Guide and it’s amazing how useful it is. Savvy fabric websites like Emma One Sock and Gorgeous Fabrics already use Pantone color numbers in their fabric descriptions, and I hope this becomes a standard for all fabric and sewing trim websites (are you listening, M&J Trim and Fabric.com?) I love on-line fabric shopping, but frankly, for fabric selection you should not trust the colors displayed on your monitor, especially for reds and blues, which have a huge range of color, saturation and hue. It’s so much easier to be confident of a color when you can look it up in your Pantone Guide to really get an accurate sense of what it looks like. 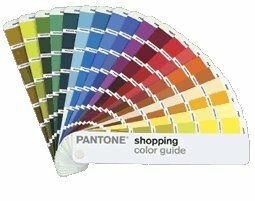 The Pantone Shopping Color Guide ($19.95) is the version you want, other Pantone color decks are pricey ($100+) and are really intended for design professionals. Once caveat: Pantone seems to hide this on their web site, and will ship it only within the US and Canada. Els asked me to get one for her, and the shipping to Europe ended up being more than a third of the price, so I suspect that’s why this is a US/Canada only item on the US Pantone web site. Pantone’s color system is a global standard however, I googled “Pantone UK” and “Pantone Germany” and got web sites for each, so with some perseverance you might find this outside the US. 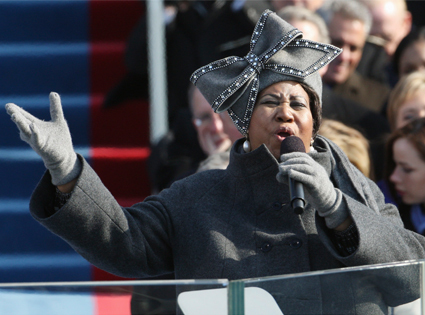 Cidell asked me what I thought of Aretha’s hat. Well this is why it was such a stunning choice. 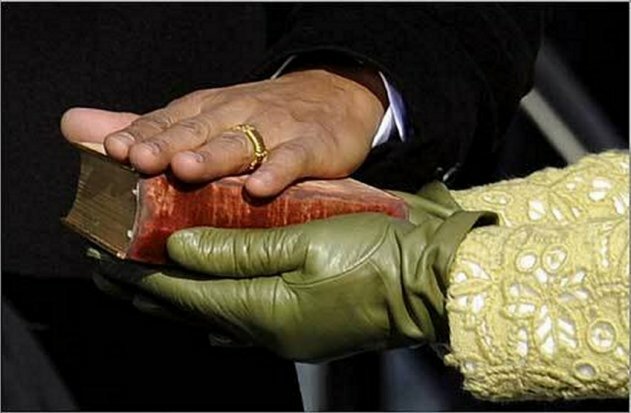 Now just imagine that you are in the audience at this momentous occasion. Imagine what those huge (12mm) Swarovski stones look like in the bright winter sun. Imagine being so far away that you can’t actually see her, but you can hear that voice and the rhinestones are flashing in your eyes while she’s singing. You cry because they are so bright and it hurts but also because of the emotion in the moment. Aretha was the Statute of Liberty, her brilliant hat was her crown and the microphone was her torch. Worn with a delicate light green guipure wool lace coat and matching dress by Isabel Toleldo. 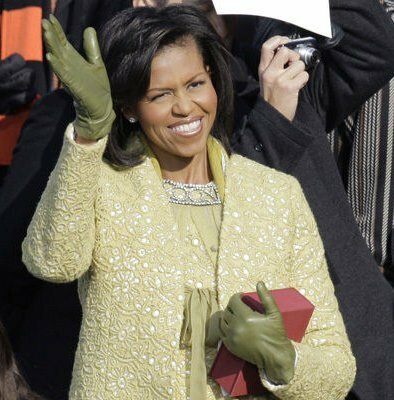 Some news sources have reported that Michelle’s outfit was yellow, but I think its really a yellow green; and besides who would wear green gloves with a yellow lace coat? Isabel Toledo is one of my favorite designers, and this ensemble is different for her, she generally has that sharp Spanish style of tailoring, this coat and dress being softer than her usual work; this looks almost Chanelish. 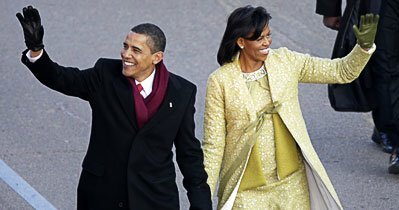 Given the bitter cold on the east coast right now, the First Lady stayed warm with a coordinating cashmere scarf and a cardigan with a lovely diamante collar. Sublime. Here is a photo of the center front piece pinned to my dressform; as you can see, the darts wrap around the body and they are hidden in the tucks. Needless to say I panicked and immediately inspected my sample to determine the type of fabric I have, and this wool knit is indeed interlock, albeit one that is very lightweight, but it does have the stability that Gail references. Whew. Now that I know the exact fabric this design requires, I need to hit Jo-Ann’s to find an inexpensive interlock to use for muslins, which brings me to my pattern observations. I’ve decided to go down one size to a 12 for the 1stmuslin. Vogue slopers have linebacker shoulders, and I have narrow shoulders. This dress really hangs from the shoulders and bust. Fortunately, the shoulders and sleeves are simple, there is no set in sleeve, just a kimono-like shoulder with a single seam that runs runs down the top of the arm from the side neck to the wrist. Ease is supplied by the knit fabric and under arm gussets. To determine your own size match the pattern as closely to your bust size as possible because the skirt portion is a very simple A-Line shape that skims the body and will be easy to alter; the fit through the bust however is crucial. Next post I’ll pin the upper bodice front and back to my dressform so you can see how those pattern pieces relate to the body. Next post: How I’ll tackle the muslin and more photos of the pattern pieces.